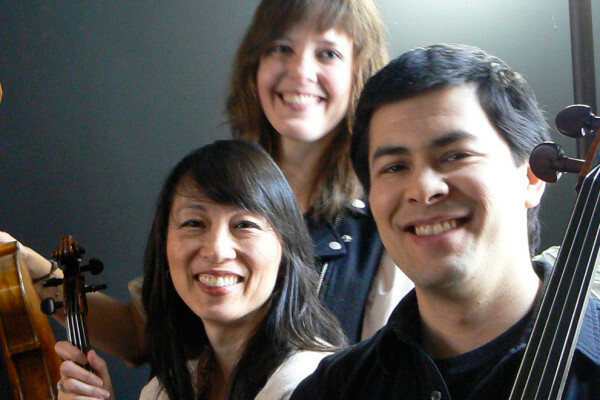 Trio Tritticali (Helen Yee, violin; Leanne Darling, viola; Loren Kiyoshi Dempster, cello) draws upon their training in jazz, classical, Arabic, Chinese, avant garde and improvisational traditions to create a new jamming universe of string sound. It’s Turtle Island meets Haitian voodoo trance, and Jean-Luc Ponty in arabesque. It’s minimalism moves to Mongolia, and Thelonius Monk with a ticket around the world. Since its founding in 2008, Tritticali has appeared at the Summer on the Hudson series, Roulette, Caffè Vivaldi, and The Stone, as well as a regular show at Linger Café. Also on the bill is 2125 Stanley Street: choreographer Dahlia Nayar joins Queens-based artists Margaret Paek (dancer), and Loren Kiyoshi Dempster (cellist/composer) in exploring notions of home. The project is a deeply personal investigation of cross-cultural belonging and not-belonging, and the beauty and challenge of creating a habitat or multiple habitats scattered around the globe in contemporary society. Using minimal domestic objects and tasks (socks, clotheslines, pots and pans) and an evocative soundscape, we attempt to reconstruct or re-imagine a poetic consciousness with a focus on intimate exchange within the realm of the domestic. Ultimately, we aim to invite the audience into a home that is constructed primarily through movement and sound, a home that is both familiar and yet cannot exactly be located.